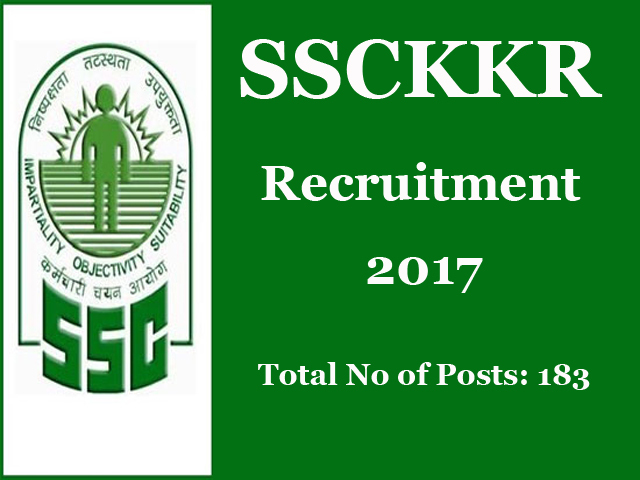 Staff Selection Commission Karnataka-Kerala Region (SSCKKR) has released a recruitment notification for 183 posts of Junior Engineer, Assistant (Legal) and More. Interested candidates may check the eligibility criteria and apply online from 12-05-2017 to 07-06-2017. how to apply and important dates, are given below. Junior Engineer: Candidates should have attained Bachelor’s Degree in Science with one of the subjects as Physics, Computer Science or Electronics, OR Diploma in Engineering or Technology in one of the disciplines viz., Electronics, Electrical, Computers, Information Technology or Electronics and Telecommunication, OR Technical Education and One Year experience in Production from recognised University or State Board. Assistant (Legal): Candidates should have attained Graduation Degree in Law from a recognised university established or incorporated by/under a Central Act / Provincial Act / a State Act / any Institution. Selection Process: Selection of candidates will be made on the basis of the Computer Based Objective Type (Multiple Choice Questions) Test and Written Examination. Application Fee: General, UR and OBC candidates have to pay Rs. 100/- through SBI Bank Challan with net-banking, credit/debit cards or cash. Women candidates and SC/ST/Ex-Servicemen/PWD candidates do not have to pay any fee. How to Apply: Interested and eligible candidates may apply online through SSC website "http://ssconline.nic.in" from 12-05-2017 to 07-06-2017.